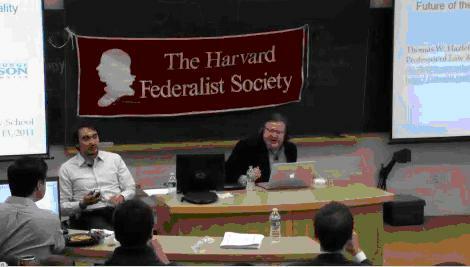 With all the attention on net neutrality this week, I thought I’d bring your attention to a debate on the-issue-that-won’t-go-away between Tom Hazlett and Tim Wu, which took place earlier this year at Harvard Univerisity. Below is the MP3 audio of the event, but if you want to check it out in living color, [check out the video](http://iep.gmu.edu/event/harvard-law-school-net-neutrality-discussion-thursday-january-13-2011) at the Information Economy Project wabsite. Next post: A Vision of (Regulatory) Things to Come for Twitter?